Salukis: What's Good About 'Em? What's Bad About 'Em? Salukis: the most honest dog breed review you'll ever find about Saluki temperament, personality, and behavior. One of the swiftest and most graceful of all breeds, the aristocratic Saluki is possessed of a quiet dignity and independence. Once past the destructive puppy stage, he is docile and quiet indoors, a creature of comfort who prefers soft beds and sofas on which he can lounge and survey his domain. However, his fragile appearance is deceiving: At full gallop he is so incredibly fast (up to forty-five miles per hour) and has such strong chasing instincts that he must not be let off-leash except in a safe, enclosed area. And he is an agile jumper, so fences should be at least six feet high. Salukis are aloof (often cautious) with strangers and require early socialization to encourage an outgoing attitude. Generally sociable with other dogs, he will pursue anything that runs, including small pets, and he can react with lightning reflexes. The Saluki is an independent thinker, yet sensitive to correction, so he should be trained calmly and coaxed with food and games. However, this breed does need firm boundaries or he will be quick to take advantage. Many sighthounds are touch-sensitive, tending to startle if touched unexpectedly and uncomfortable when cuddled excessively. A verbal correction is more effective than a physical one, because it is less upsetting and distracting to the dog. A Saluki may be right for you. 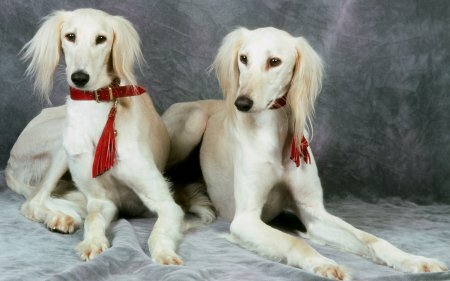 A Saluki may not be right for you. You can avoid some negative traits by choosing an ADULT dog from an animal shelter or rescue group. With an adult dog, you can easily see what you're getting, and plenty of adult Salukis have already proven themselves not to have negative characteristics. Finally, you can avoid some negative traits by training your Saluki to respect you and by following the 11-step care program in my book, 11 Things You Must Do Right To Keep Your Dog Healthy and Happy. Providing enough running exercise in a safe area. Salukis don't need miles of running, but they do need regular opportunities to vent their energy through all-out galloping a few times a week. Otherwise they will become bored, which they usually express by destructive chewing. Salukis need access to a large fenced area – fenced because these independent dogs are likely to take off and not come back. If there is a dog club in your area, get your Saluki involved in lure coursing (chasing a mechanized lure around a track or across an open field). This is an appropriate outlet for the full-speed galloping behaviors that are "hardwired" into his genes. Providing enough socialization. Standoffish by nature, Salukis need extensive exposure to people and to unusual sights and sounds. Otherwise their natural caution can become skittishness and timidity, which are difficult to live with. The independent temperament. Like all sighthounds, Salukis are not eager to please you. They are independent thinkers who look out for their own best interests. Most Salukis are stubborn and can be manipulative. You must show them, through absolute consistency, that you mean what you say. In other words, you must teach your Saluki to respect you. A dog who respects you will do what you say and will stop what he's doing when you tell him "No." Read more about Saluki Training. Chasing other animals. Most people do not realize just how fast and agile sighthounds are, or how strong their instincts are to chase and seize other creatures that run. A Saluki can seriously injure or kill your neighbor's cat or toy dog. You must take great care to supervise and control your sighthound around smaller animals. Emotional sensitivity. Be honest.... is there tension in your home? Are people loud or angry or emotional? Salukis are extremely sensitive to stress and can end up literally sick to their stomachs, with severe digestive upsets and neurotic behaviors, if the people in their home are having family problems. Sighthounds are peaceful, sensitive dogs who need a peaceful, harmonious home.